A show of Aqeel Solangi’s work took place at Chawkandi Gallery on 28th February 2019. Curated by Aasim Akhtar, this was a solo exhibition of Solangi’s work, which comprised of artworks from his entire tenure, having spanned over ten years. Hailing from Sindh, Solangi graduated with honours from the National College of Arts, Lahore (2003) and later received a master’s degree in Visual Art in 2005. He was awarded his second master’s degree from the Bath School of Art and Design, UK in 2016 and has exhibited both nationally and internationally. The exhibition titled ‘Fictional Homelands’, consisted of selected works by Solangi during the years of 2008 and 2018, with his visuals comprising of motifs such as, stones, draperies and flowers. Shedding light upon his travel experiences, beliefs and memories, the artist uses archives as a source of inspiration and recreates spaces from imagination, with specific poetry and literature being the inspiration of his work, like those of Faiz, Nasir Kazmi, Bhittai and many more. In Solangi’s art, bodies of water have been represented multiple times, possibly an interpretation of certain dreams or any sort of suppression that the artist has undergone in his past. In one painting a man is shown walking over a body of water; the man in a seemingly hypnotic state while drapery is shown to be hanging besides it. 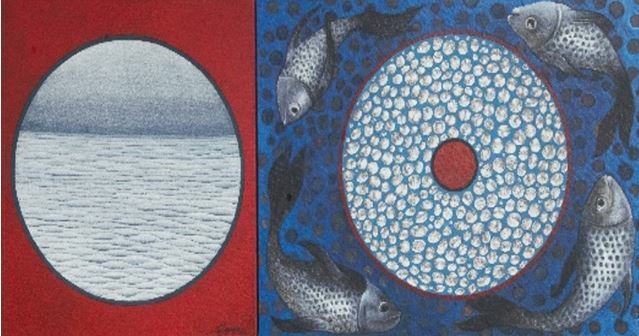 Since the artist has intended to highlight his personal beliefs and experiences in his art practice, the depiction of a deep-water body could be symbolic of his struggles or desires. The second most commonly used motif in Solangi’s work is the flower, or rather a variety of flowers. 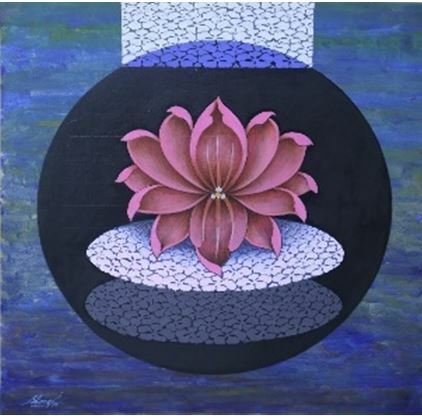 In his painting titled ‘Lotus’, created in 2012, a lotus flower is shown blooming above a floating surface of tiny periwinkle flowers, the periwinkle flower being the most commonly used motif by the artist. The flowers could be a symbol of fertility and growth, possibly of the artist’s own character. 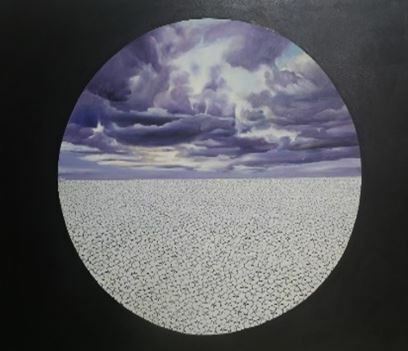 In the visual, ‘Bahaar Aaee to Jaise’, dark clouds are shown gathering above a field of flowers, which have also been depicted multiple times in the artist’s visuals. This particular imagery could be symbolising a moment in the artist’s life while travelling or it could also be representation of a particular storm he has experienced. While a silver lining shines through those clouds, the flowers and the light could be symbolic of the peace and happiness that he has achieved over time. An interesting artwork titled ‘Yin and Yang’ consisted of the symbol being made of the same periwinkle flowers; one could interpret this visual as a message of equality within the gender spectrum and the balance of energies within them. What also needs to be noted in this body of work is the colour palette and the surrealistic look of his paintings; the tones of this cool yet darkened palette could be a representation of the world which, one gets to view through the artist’s perspective; a world which does not belong to the ordinary viewer, although the artist intends to make his landscapes look realistic and familiar to his audience. Even in his visual titled, ‘the Enigma of a familiar place’, a man is shown staring off into a raining seascape while the view itself is shown through a doorframe. This painting made by Solangi not only conveys the idea of experiencing a familiar space but it also gives off vibes of an alien land, taking into consideration the artist’s use of a mesmeric colour palette and the subliminal motifs. After viewing this entire body of work, one cannot avoid the details present in the visuals in terms of his skill and language, which also reflect upon his personality: mysterious and imaginative. Solangi’s paintings have a sense of intimacy about them, where the viewer is taken into a different dimension; a space so surreal that one can almost touch and feel the surroundings present in the painting. His works not only defines his own concepts and beliefs, but they also leave the viewer to their own individual perception; each image speaks about a different experience of the artist and in turn, provides a unique experience for each of its viewers.